A marriage made on the bandstand. Digital and analog technologies deployed together to take advantage of digital signal processing and analog UHF transmission. Having a DSP chip to process the audio replaces hundreds of components relative to traditional systems with analog companding circuitry. This increases reliability and reduces background system noise. The vocal signal is then transmitted over Vocopro’s field-proven UHF technology. It is offered at a great price, making the Vocopro UDH-DUAL a revolution in both performance and value. Plug and Play design requires no microphone syncing set-up. 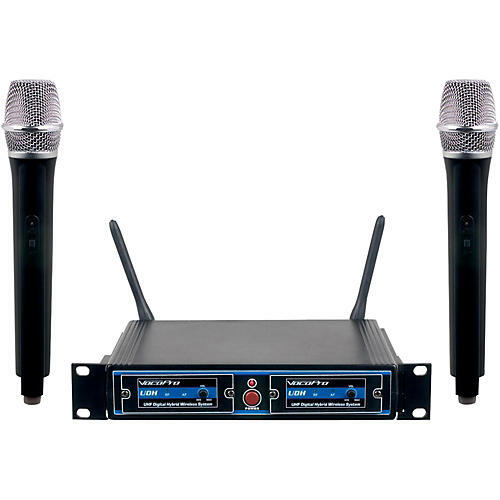 Quickly scale up to 4 microphone channels by attaching an additional UDH receiver with no tools required.